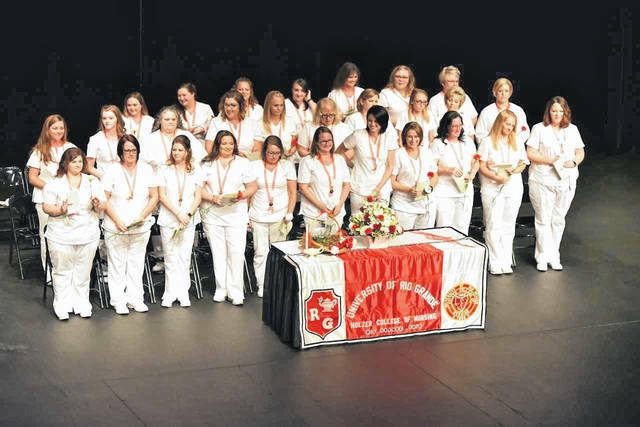 RIO GRANDE, Ohio — The University of Rio Grande and Rio Grande Community College recognized 34 Class of 2018 graduates from the Holzer School of Nursing’s Hybrid LPN-RN Advanced Placement Track with a pinning ceremony Friday, Aug. 10. Dr. Donna Mitchell, Dean of the College of Professional and Technical Studies, said the students have done extremely well in this hybrid program. Two students received scholarship awards at the ceremony. Katosha Noe of Winfield, W.Va., was awarded the Highest GPA Award through Holzer Medical Center, and Dalline Fields-Adkins of Huntington, W.Va., was recognized with the Merrill L. Evans Spirit of Nursing Award. Jessica Patterson is a communications specialist at the University of Rio Grande.